Which Structures are at Risk in a Neck Hematoma? Another rare injury that can happen after a car crash is a neck hematoma. A serious neck trauma car occasionally lead to hematoma of the neck. Other common causes of neck trauma include suicide attempts and hanging. The areas of the neck that are most predisposed to trauma are the anterior parts of the neck, such as the trachea and larynx. The upper portion of the neck is protected mostly by the head, whereas the posterior aspect of the neck is protected by the cervical spine. Obvious area of increased focal swelling about the neck. Bruising of the neck area. Pain with palpation to the affected area or secondary to coughing or swallowing Crepitus, which is the finding of air in the soft tissue. Resistance to passive maneuvers of the neck. Paralysis of the opposite side of the body. Diagnosis of a Neck HematomaA chest x-ray or x-ray of the neck may show areas of swelling or displacement of vital organs of the neck, such as the trachea or esophagus. The hematoma itself may be visible on x-ray. 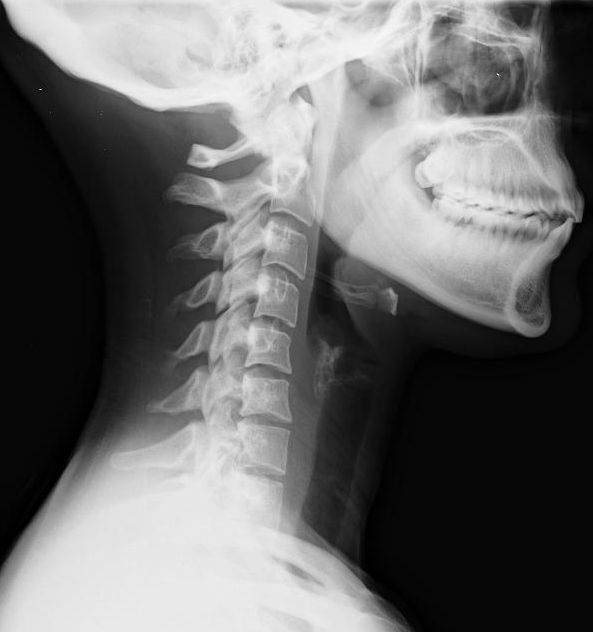 CT scan of the neck may show a large area of pooling of blood in one area of the neck. An MRI scan of the neck will be able to show areas of soft tissue and bleeding, showing which areas may have been disrupted by the hematoma as well as the patency of the trachea and the carotid artery. Color flow Doppler ultrasonography can show areas of stagnant and flowing blood within the neck. In some cases, this is not enough and neck angiography must be done to show where the bleeding is coming from. Because the neck is so vascular with large arteries and veins, the hematomas tend to be quite large with ongoing bleeding that require surgical intervention to stop the bleeding before there is compression of major structures in the neck. Contrast studies of the esophagus can show if it is being impeded upon by a large hematoma. In some cases laryngoscopy, pharygoscopy, bronchoscopy or esophagoscopy can be performed to see where there are active areas of bleeding, hematoma formation or disruptions of the larynx, esophagus, trachea or major bronchi. A CBC and blood typing should be performed in cases of rapidly increasing hematomas. This is because the blood loss in major throat trauma can be extensive and there is a chance that this is a person who will need to receive at least one blood transfusion to make up for the extravasation of blood from the circulatory system to the soft tissue areas of the neck and chest. Management of Neck HematomasIf the patient is stable, ice to the affected area should be applied as soon as possible in order for you to slow the rate of internal bleeding as much as possible and to reduce swelling of the tissues. Airway management is a very important part of managing neck hematomas. The airway can be compromised at any time, so if you are seeing evidence of breathing distress, endotracheal intubation should be considered. This should be done before there is too much narrowing of the airways from pressure due to the hematoma. If you start breathing for the patient with an endotracheal tube and there is ongoing respiratory distress, consider that this may represent a tension pneumothorax, which needs needle decompression on the side of the tension pneumothorax along with the possibility of chest tube placement to maintain expansion of the lungs. In general, direct pressure on the area of bleeding will slow the bleeding down enough so that there is no significant compression on vital structures. If this is not possible, such as if the source of the bleeding is deep within the neck, the patient may need balloon tamponade to stop the bleeding internally. If direct pressure is not possible and the airway is occluding, consider undergoing a cricothyroidotomy with packing of the pharynx to control upper airway bleeding that is contributing to the neck hematoma. Which Structures are at Risk in a Neck Hematoma?The neck is a fairly compact space that contains many nerves, blood vessels, the thyroid gland, airway and gastrointestinal structures. The larynx and trachea are especially at risk because of a lack of supporting structures to stanch the bleeding. Between the airway and the spinal structures is the esophagus as well as the major blood vessels of the neck. There are two fascial layers that blood can pass within. There is the deep cervical fascia that surrounds the trapezius muscles and the sternocleidomastoid muscles. It separates out the pre-tracheal region, which includes the larynx, trachea, pericardium and the thyroid gland, the prevertebral space, which contains the brachial plexus, the phrenic nerve, the prevertebral muscles, and the axial sheath, and the carotid sheath, which houses the vagus nerve, the internal jugular vein, and the carotid artery. The musculoskeletal structures that can be impinged upon by a hematoma include the cervical muscles, ligaments and tendons, the first and second ribs, the hyoid bone, the vertebral bodies, and the clavicles. Nerves that can be damaged include the phrenic nerve, the last three cranial nerves, the brachial plexus, the spinal cord, the stellate ganglion and the recurrent laryngeal nerve. Vascular areas at risk for compression include the carotid artery, vertebral arteries and the brachiocephalic, jugular and vertebral veins. As to visceral areas at risk, there is the esophagus, the thoracic duct, larynx, trachea, and pharynx. Glands that can be affected in a cervical hematoma include the parotid glands, parathyroid glands, submandibular glands and the thyroid gland. Neck hematomas can be extremely dangerous because the bleeding can be brisk and the blood can travel through the fascial planes in order to compress vital areas of the nervous system, circulatory system, viscera and the musculoskeletal system.